The Queen has today attended the annual Remembrance Day service at the Cenotaph in London, accompanied by members of the Royal Family. She laid a wreath of red poppies at the base of the Cenotaph, followed by the Duke of Edinburgh, the Prince of Wales, the Duke of Cambridge, the Duke of York, the Earl of Wessex and the Duke of Kent, as well as Prime Minister David Cameron and the leaders of the opposition, Nick Clegg and Ed Miliband. The service of remembrance was then led by the Bishop of London, Richard Chartres. As she left Whitehall, Queen Elizabeth was given a soft round of applause by the crowd, a gesture seen as appreciation following the foiling of a terrorist plot on British soil earlier in the week. 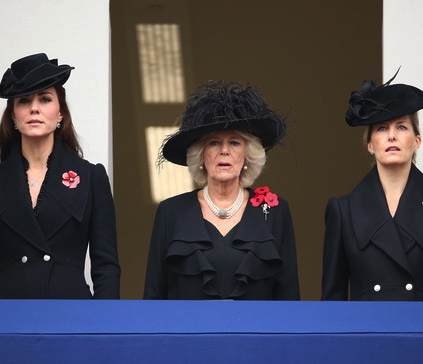 The Duchess of Cornwall, the Duchess of Cambridge and the Countess of Wessex watched the proceedings from the balcony of the Foreign Office, as did the Duke and Duchess of Gloucester and Princess Alexandra of Kent. Prince Harry, meanwhile, was representing his grandmother at a service at the Kandahar Airfield in Afghanistan. The Prince attended the service alongside British soldiers still stationed in the war zone. He laid a wreath bearing the quote, “There is no greater love than to lay down one’s life for one’s friends. They will never be forgotten,” from the Bible passage John 15:13, which Harry also read during the service. Tagged Afghanistan, Elizabeth II of the United Kingdom, Military, Prime Minister Cameron of the United Kingdom, Prince Harry of Wales, Princess Alexandra Lady Ogilvy, Remembrance Day, The Countess of Wessex, The Duchess of Cambridge, The Duchess of Cornwall, The Duchess of Gloucester, The Duke of Cambridge, The Duke of Edinburgh, The Duke of Gloucester, The Duke of Kent, The Duke of York, The Earl of Wessex, The Prince of Wales. From what I saw the service yesterday was very nice, and good of The Queen to attend with her family after the scare to Her Majesty. What Prince Harry did to represent Her Majesty in Afghanistan was very special and Her Majesty must be very proud of Prince Harry and Prince William in all they do for the service to Country.